Now that you’ve installed Py6S, this section will give you a brief guide on how to use it. It is also very easy to get help on individual parts of Py6S from within IPython. Simply type any name, and append a ? to it - for example AeroProfile.MultimodalLogNormal?. The documentation which is shown will describe the parameters required and give an example of usage. The SixS class is at the heart of Py6S. It has methods and attributes that allow you to set 6S parameters, run 6S and then view the outputs. # Plot these results, with the y axis label set to "Pixel Radiance"
You will see a number of buttons in the window that is showing the graph. These allow you to zoom in to specific areas of the plot, move the plot around, adjust the margins, and save the plot to a file. This shows the utility of Py6S very nicely - imagine how long it would have taken to produce this plot by editing and running 6S input files manually! However, the plot probably isn’t particularly helpful as the defaults I’ve chosen probably aren’t the parameters that you want to use for your simulation, and you may not be interested in the calculated pixel radiance. The sections below will explain how to alter this simple program to produce more useful results. 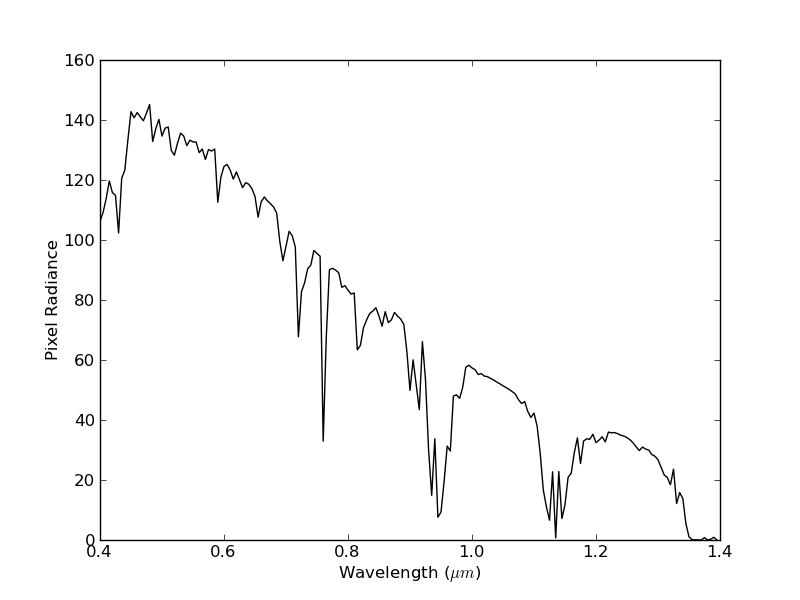 You can see here that we have changed the atmospheric profile to a pre-defined profile called ‘Tropical’, and changed the wavelength that we are using for the simulation to 0.357 micrometres. You can also see that here we’re accessing the outputs directly, rather than running it over a specific wavelength range and plotting it. Try finding out what other outputs you can access, by typing s.outputs. and pressing TAB. This is far more detailed, but should be self-explanatory given the comments and the table above. Far more details about the individual parameterisations are available in their documentation pages. You can see that in this instance the change in pixel radiance over different atmospheric profiles is fairly low (< 0.8). Again, this saves a lot of time and complex input file editing. That’s it for the quick guide to setting parameters - for more details see the rest of the documentation. The outputs stored under s.outputs.values are the main outputs of 6S provided on the first two ‘screenfulls’ of raw 6S output. The names of the outputs in Py6S have been kept as similar to the labels in the raw 6S output as possible, although sometimes names have been changed to improve clarity. Remember that a list of all possible outputs can be gained by typing s.outputs. and pressing TAB in IPython. Py6S supports running across all of the bands for all of the sensors that 6S supports - see the documentation for SixSHelpers.Wavelengths for more details. 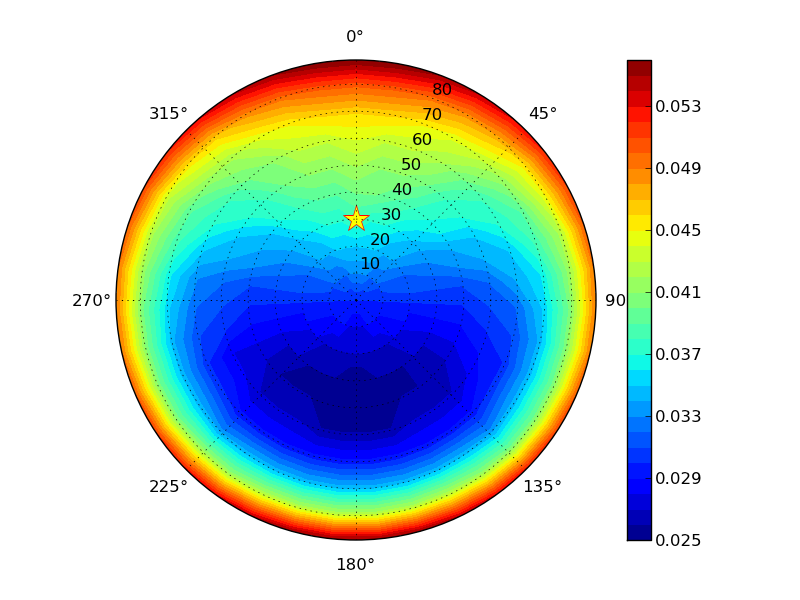 #  option is to vary the solar angle) and plotting the pixel reflectance. Another common task is to parameterise 6S with some values collected from real-world measurements, so that the results of 6S simulations can be directly related to measurements in the field. Detailed descriptions of these functions are given on their respective pages.